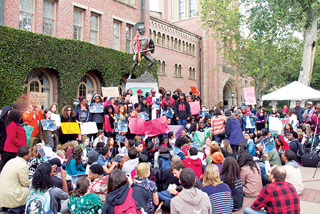 Almost 50 years after the Watts Riots of 1965 erupted which resulted in six days of unrest and caused $40 million in damages, and 21 years following the infamous Rodney G. King video beating that led to the revolt of 1992, allegations of LAPD racial profiling have landed on the University of Southern California campus. 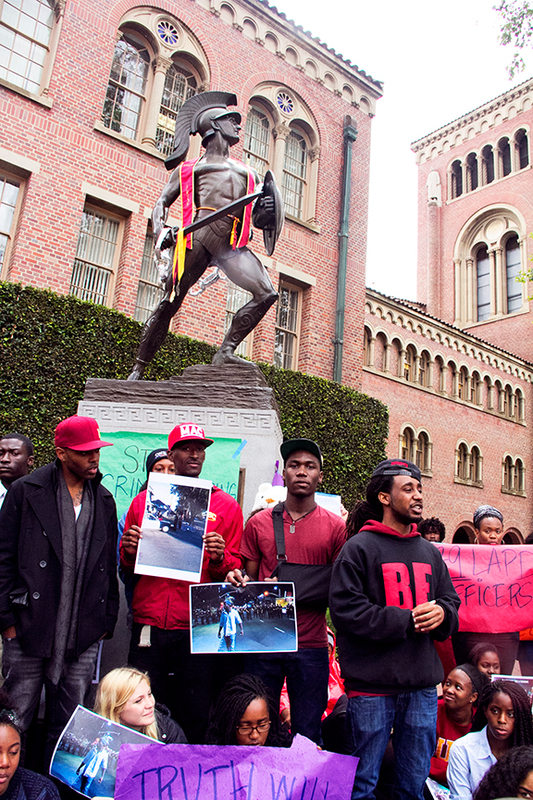 The May 5 early morning arrests of six USC African American students who attended a graduation party, seems to have heightened the contentious debate of bias against Blacks by one of the largest police department’s in the nation. 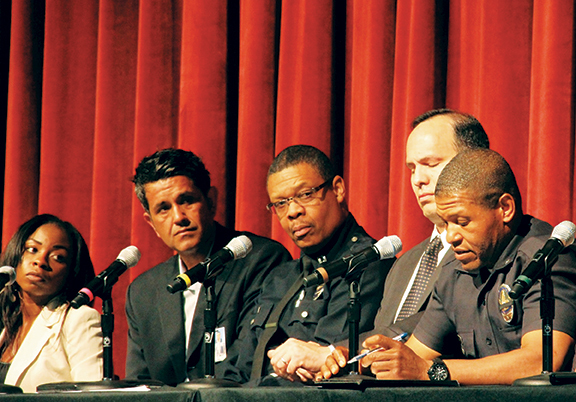 During an open discussion at the Ronald Tutor Campus Center an overflow gathering of protestors estimated beyond 400 sharply criticized both the LAPD and campus safety officials at an organized town hall meeting held on Tuesday, May 7. Moderated by Professor of Law Jody David Armour with a panel that included LAPD Inspector General Alexander A. Bustamante, LAPD Commander William Scott, USC Executive Director and Chief of Department of Public Safety John Thomas and LAPD Captain Paul A. Snell of Southwest Community Station, students sought answers and ongoing solutions to prevent future occurrences of such incidents. “My fellow students of the University of Southern California one of the most prestigious universities in the nation, a school at which the majority of the freshman class are in the top 10 percent of the graduation class. I saw first generation college students crying, confused and wondering why they were being treated like the enemy and I, like the abused need answers,” emphatically stated student Rikiesha Pierce who attended the party, held at the home of fellow student Nate Howard. Early on Sunday May 5 the department’s Southwest Station received a complaint call about loud music at approximately 12:20 a.m., but did not have a unit dispatched until 2a.m., according to Cpt. Snell. When they got there, Lt. Andy Neiman said they discovered there were two parties going on across the street from each other. According to news reports, Howard’s party was attended by mostly Black students, while the party across the street was attended by mostly White students. “The officers went to the first party and told them there had been noise complaints so they needed to turn the music down and reduce the noise,” Neiman City News Service. Neiman said that while the officers were at the second party, whose organizers complied with the cease and desist order, the noise and music started up again across the street at the first party. “So the officers went back over to the first party to cite the organizer because of the noise,” Neiman said. But both Pierce who led Tuesday’s discussion and Howard said they willfully cooperated with the officers’ command to disperse the African American students, but were treated rudely. LAPD arrested six students, some sustained injuries during the intervention. The six students arrested were charged with disorderly conduct and interfering with police, but a graphic video shown to the audience revealed an emotional gripping account of what the students experienced that morning. The video, which immediately went viral and exploded on social media, depicted students being arrested, shoved into the back of police cruisers, the sound of a police helicopter loudly hovering above the melody of the music that punctuated the scene amid screams of colliding voices. For Howard, who said he did all of the necessary things to host the party by registering the event with the Department of Public Safety, the past few days have been like a nightmare from hell. Organizers of the competing party said they didn’t even register their party with campus security. At the meeting, while Cpt. Snell attempted to quell the notion that the events were racially motivated, white neighbors of Howard spoke and said the LAPD never came to their house and that they turned their music down on their own. Cpt. Scott asked the audience if they thought the incident was racially inspired and the majority of the crowd raised their hand. “I hear you! We hear you and I promise that we will look into to this,” said Scott. 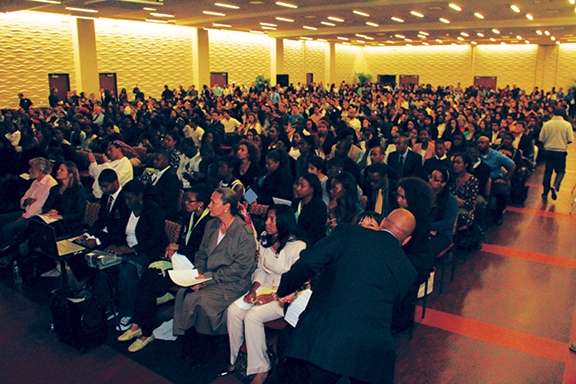 “I was moved because I am a graduate of the University of Southern California. My daughter is a student here,” said Councilwoman Jan Perry, who cried after Pierce made her plea for justice at the meeting. 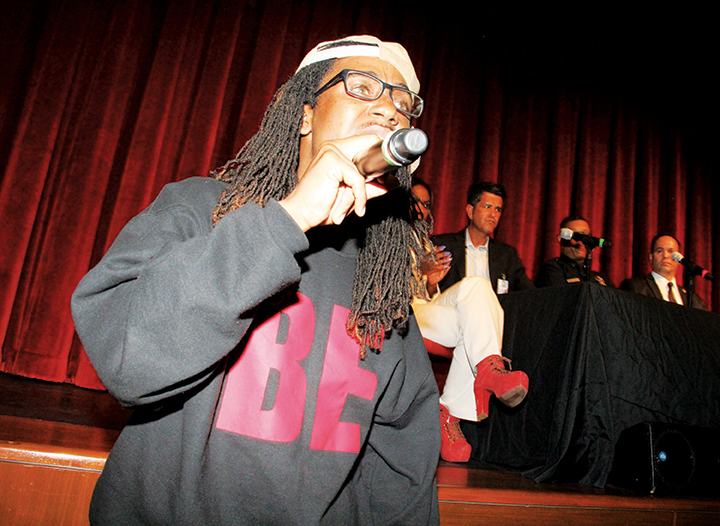 Perry was sitting in the audience not in an official capacity but as alumni and parent. 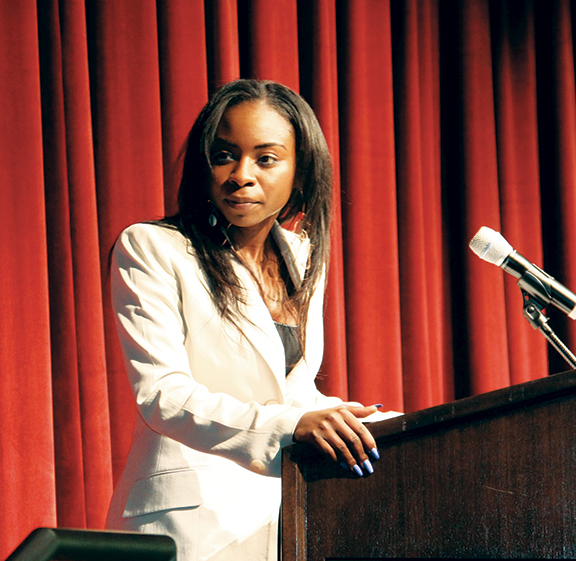 “I want to be proud of my community and the university and I know that LAPD has worked hard to improve relations, but to witness something like this and for it to be recorded by the hands of these young people who clearly are high achieving and very dynamic and it broke me down…it just broke me down,” she said. “Social media started this and social media will drive it,” she added. Meanwhile, university officials indicated they would ask for all charges to be dropped and will also offer counseling to individuals at the event who were impacted by the circumstances. Attorney Fred Dorton of the The Dorton Firm said that he is representing the six students who were arrested, but could not speak about their cases or release their names. Rep. Karen Bass sent a message that she will be issuing a statement on the matter. Pierce and Howard are both seniors and this week should be preparing for final exams and graduation ceremonies to take place on May 16.